If you make the ice cream in the previous post, you’re going to find yourself with an excess of egg whites: specifically, six egg whites that you should not, by any means, throw away. Resourcefulness is what separates good home cooks from great ones; and there, with that bowl of egg whites, you can make a delicate, memorable dessert, especially if you top it with whipped cream and berries. The dessert in question is pavlova, named after the Russian ballet dancer Ánna Pávlova. Depending on your taste for sweets, it may either be the best or worst dessert you’ve ever tasted. I had no idea what she was talking about when she Tweeted that (it’d been a long time since I last made pavlova) but when, after finishing this batch, I bit into one I couldn’t shake her words as my teeth sank through the crisp exterior to the soft, marshmallowy interior. “Calf slobber” echoed around my head as I chewed and chewed. Regina’s dad had a point. Craig, who does not have a sweet tooth, bit into one last night and nearly gagged. “Ugh,” he said, “nasty!” He threw the rest of his out. And so there you go: several perspectives on the same dessert. But, again, if you have the egg whites, it’ll cost you little–except time–to give pavlova a whirl. I used a recipe from my friend Elise’s site Simply Recipes (the recipe is written by another friend, Shuna Lydon, of Eggbeater). Whether you think the result tastes like heaven or calf slobber, at least you didn’t let those egg whites go to waste. 1. Place rack in the middle of the oven and preheat the oven to 275°. Line a large baking sheet with parchment paper. Pour the vanilla and vinegar (if using) into a small cup. Stir the cornstarch into the sugar in a small bowl. 2. 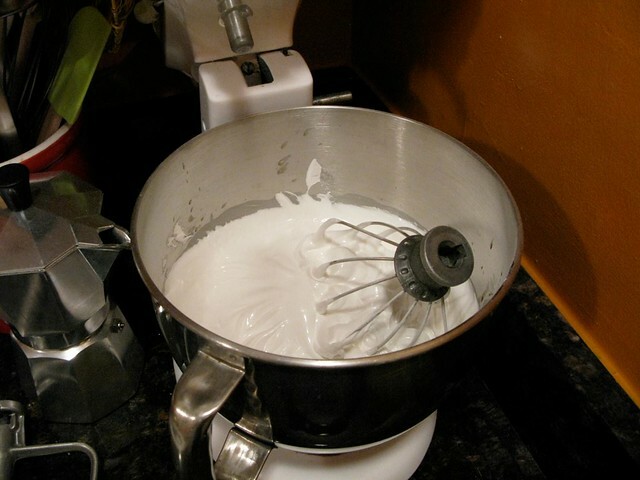 In a large bowl of a heavy-duty mixer, fitted with whisk attachment, whip egg whites, cream of tartar (if using) and salt, starting on low, increasing incrementally to medium speed until soft peaks/trails start to become visible, and the egg white bubbles are very small and uniform, approximately 2 to 3 minutes. 3. 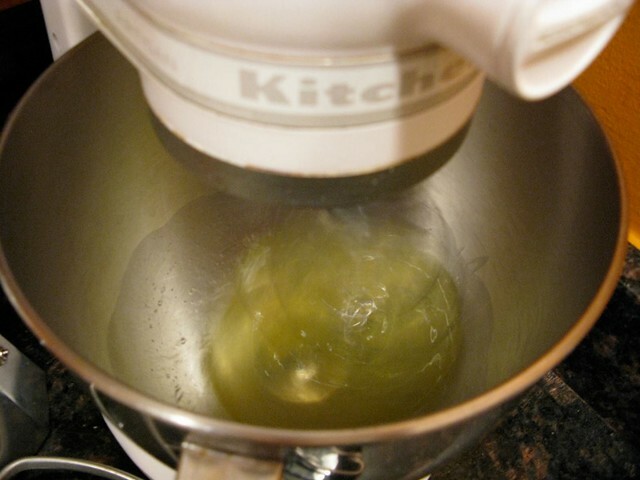 Increase speed to medium-high, slowly and gradually sprinkling in the sugar-cornstarch mixture. A few minutes after these dry ingredients are added, slowly pour in the vanilla and vinegar (if you didn’t use cream of tartar.) 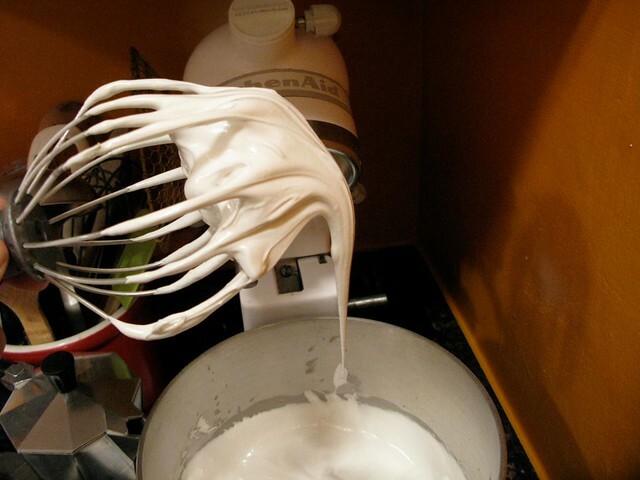 Increase speed a bit and whip until meringue is glossy, and stiff peaks form when the whisk is lifted, 4 to 5 minutes. 4. 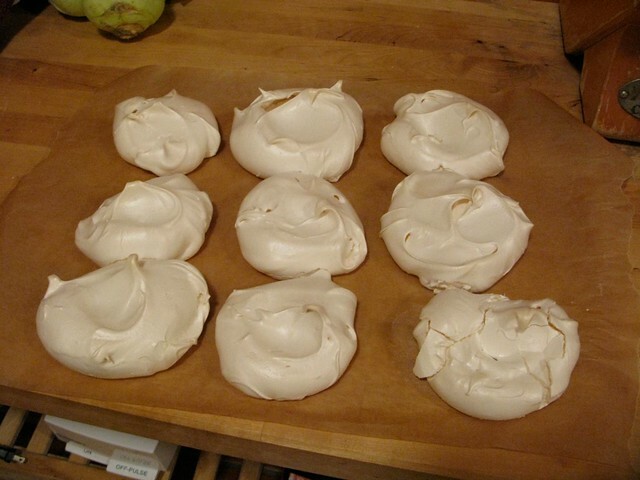 Pipe or spoon the meringue into 8-10 large round mounds that are 3 inches wide on a baking sheet lined with parchment paper or a silicon liner. With the back of a spoon, create an indentation in the middle of the mound for holding the filling once meringue is baked. 5. Place baking sheet in the oven. Reduce oven temperature to 250°F. Bake for 50-60 minutes, or until the meringues are crisp, dry to the touch on the outside, and white — not tan-colored or cracked. The interiors should have a marshmallow-like consistency. 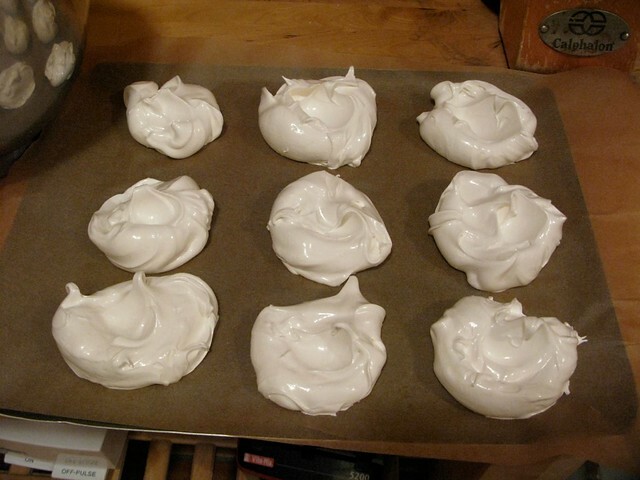 Check on meringues at least once during the baking time. If they appear to be taking on color or cracking, reduce temperature 25 degrees, and turn pan around. 6. Gently lift from the baking sheet and cool on a wire rack. Will keep in a tightly sealed container at room temperature, or individually wrapped, for up to a week if your house is not humid. 7. Served topped with your favorite filling – lemon curd, raspberry or blueberry sauce, and freshly whipped cream.